In Part II, we will look at where different types of learning methods fit in to the three Modes of Conceptualize, Training, and Experience. Conditioning is another method of learning. This method can be thought of as part Training and part Experience. The Training part is the repetition of a stimulus as a means to create the desired response. Effective conditioning vastly reduces the amount of training required. Conditioning responses are usually limited in scope. Therefore, this type of training has only specific usefulness. The Experience aspect of conditioning is that the stimulus and responses feels “real” to the person. Thus, it is a limited type of simulated experience. Overall understanding of something learned primarily through conditioning is also limited. You may be able to conceptualize why your body responds in a certain way. You may have developed a particular conditioned response. But you have not developed a deep understanding of the subject at hand. Learning through play. This is a natural type of learning that is effective and fun. Play can be applied to all three modes of learning. The degree to which depends upon how the play is structured. Play is generally thought of as unstructured. But there are parameters which guide play. Play is unstructured structure. Play is also simulated Experience. The structured part of the play is the Training. The unstructured part is the simulated Experience. Play can also allow you to better Conceptualize your understanding of a subject. Role Playing and Scenarios to varying degrees use conditioning and play. Therefore, they are also part Conceptualization, part Training, and part Experience. Scenario training in particular is intended to be a simulated Experience. As such, scenarios incorporate the effects of strong emotions. Conceptualization is best done in a calm and relaxed emotional state. Repetitive training is also usually done with neutral or positive emotions. Effective conditioning usually requires emotional input. Role playing and scenarios are dependent upon legitimate emotions to be effective. Problems arise when the conditions of the simulated Experience don’t match up with actual Experience. This is one of the reasons that real life Experience is so important to the learning process. Experience is as Experience does. All Experiences are legitimate, but they can also can be narrow in scope (or not applicable to the subject at hand). In that respect, Experience too can be limited for creating understanding. 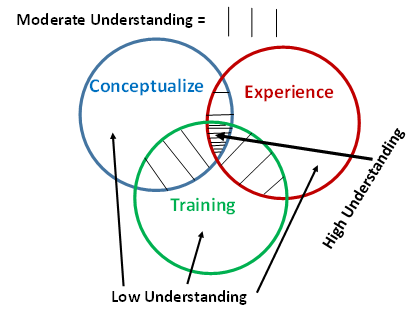 Which of the three are more important Conceptualize, Training, or Experience? That all depends upon the subject of understanding. In some respects, Conceptualize and Training are about learning to do something “correctly”. Whereas Experience is required for when things may or do go wrong. In other words, if there is no chance that your learning via Conceptualization and Training will fail, then you don’t really need Experience. Experience helps you to NOT do something incorrectly, and it helps you know what to do when things go wrong. For example, let’s say to want to understand what happens when you let an object fall. All you need is conceptualize the basic concept of gravity and be able to drop something. Assuming you are not in space or on a centrifuge, whatever you drop will fall straight down. End of story, no experience required. It always works. So, in this case experience is not important. On the other hand, let’s say you find yourself winter hiking in an avalanche zone. You have studied about avalanche theory in school. You have done lots of fitness training on the Stairmaster in your local gym. You have hiked many miles in the desert. You did some training on how to “swim” if caught in a snow slide. But you have no actual experience being on a snowy avalanche prone slope. Given the amount of things that could go wrong and the severity of the consequences, having Experience now becomes very important. The value of a mode of learning is also dependent upon it’s availability. For example, Conceptual learning is a very important aspect of learning algebra. But this type of learning is readily available at no cost on the internet. Thus it has relatively low value. On the other hand, having actual Experience fending off an armed assault is a relatively rare occurrence. Those with lots of this Experience are rarer still. Therefore, this type of Experience becomes extremely valuable to understanding how to defend yourself. The associated “cost” of this Experience is quite high. But high value doesn’t always mean it is also the most important mode of learning. It depends. Any particular learning activity could incorporate some combination of one or more of the Three Modes. In addition, an activity that is Experience for a certain level of understanding could be Training for a higher level, and Conceptualization for an even high level. For example, striking a training partner is an Experience for someone who has never hit someone before. It is Training for a martial artist, and it is part of the Conceptualization of physical self-defense. The three modes of learning are not distinct. They interact and intersect. They work together to build understanding. the Three Modes themselves are only a model designed to enable conceptualization of the learning process. The other aspects of learning are up to you.